Last month, MaRS hosted an event with Eli Groban, a senior manager at Autodesk’s BioNano group. The focus of his discussion was cloud-based software for biological design. Eli has worked for a number of biotech companies, but he quickly realized that the tools he created were shielded by IP, meaning they weren’t shared outside of specific organizations. He wanted to evolve this system, so he started talking to Autodesk. In the past, Autodesk projects focused on the non-living world, for example the expansion of the Panama Canal. Large, complicated projects formed its foundation, but the company is now moving into the living world. Biology is the next design revolution – and Autodesk wants to harness this idea to make a global impact. “Autodesk scientists are going out into the community and leveraging knowledge about process to find gaps. 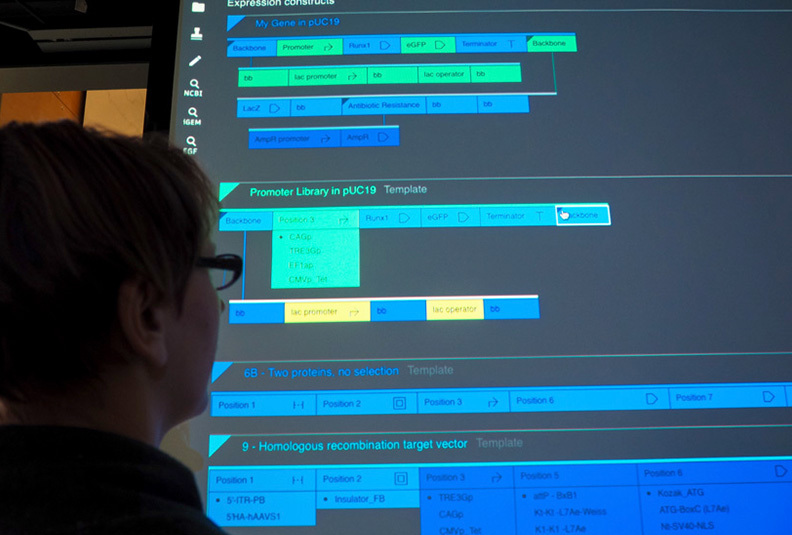 Then they design the software to fill the gaps.” Here’s a roundup of some of the tools Eli introduced us to at MaRS Discovery District. This tool has been designed for synthetic biologists/metabolic engineers, who design microbes to produce useful materials. Watch this video to learn more. So far, the Genetic Constructor leverages technology that has been used by Amyris – a company making a positive impact on the world through science– to reproduce an antimalarial treatment (artemisinin) normally taken from the Artemisia annua (sweet wormwood) plant. Artemisinin is considered one of the best therapies for malaria, but half of the people in Africa, where the disease is most prevalent, can’t afford it. This breakthrough technology has reduced the cost, increasing access to essential medical care. The Molecule Viewer is an online tool that allows scientists to view and communicate 3D protein structural data. It has a strong emphasis on user experience for scientists, who can customize, explore and share 3D molecular content to use in research, education, presentation, or outreach. Some of the features of this viewer include: creating interactive 3D molecular walkthroughs (with customized and annotated structures), sharing this authored content by generating hyperlinks (scientists can send 3D content to colleagues through a URL), compatibility with mobile/touch devices, and even smartphone virtual reality (immerse into the molecular world). In fact, the first ever structural biology lecture conducted in virtual reality used the Molecule Viewer, and took place in Potsdam. Attendees at the EMBO ICRP Conference used cardboard VR devices to immerse themselves in the virtual molecular world through their smartphones. They were able to see how a protein structure in the eye responds to light. Try it out here. He then showed us a Molecular Simulation Tools workflow for computational design and development of a molecule that could treat HIV, which moved from a 2D schematic to a 3D model, then a working model and a simulation. Autodesk BioNano has compiled and installed open source tools in cloud workflows to enable scientists to easily access a dozen computational modeling programs from a webpage. “We’ve lowered the barriers to molecular modelling by leveraging open source software. We want specialists to build applications using these tools, which involves taking computational work and putting it in the hands of biologists. Autodesk is constantly looking at automation and workflow, in order to make tools general enough so that lots of people can use them, but also customizable to individual use. For educational purposes all of the software is free, however the company will eventually be charging industry partners to adopt its tools. Charlotte Evans is a senior marketing associate at MaRS Discovery District – the world’s largest urban innovation hub.